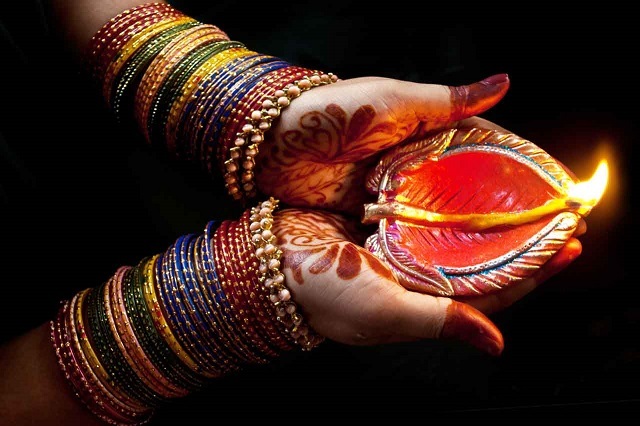 The gleaming and glorious festival of Diwali is one of the most glamorous festivals to celebrate in India. Diwali is a Hindu festival which is also known as festival of lights as it celeb rates the victory of good over evil and light over darkness. Everything is well lit with vibrant colorful lights be it markets, homes, temples or streets. Hundreds of candles and diyas adorn the homes and streets of India while the entire sky is bombarded with fireworks. While Diwali is celebrated for a minimum of two days in almost every Hindu family, in Jaipur it is celebrated over 5 days in October or November. This festival worships the goddess of fortune Lakshmi. While worship of Lakshmi is main part of the festival for the Hindu community, for us the crackers and fireworks were the most intriguing aspect. Girls and boys lighting crackers is a common view in the streets for over five days. The preparation of Diwali begins weeks before the festival comes. The preparation includes cleaning and decoration. All the Hindus dress up in their best attire which is specially bought for the festival, homes are lit with candles and lamps to spread light and brightness in every corner of the house. The party reaches its peak with more and more fireworks embellishing the wide sky. Diwali celebration is like a bright, vibrant street party while enjoying a lot of delicious delicacies prepared on the occasion. Jaipur is a royal city in the colorful state of Rajasthan. Each and every festival is celebrated with great pomp and show as the city loves extravaganza. Nicknamed as Pink City, Jaipur is one of the best places to enjoy the Diwali celebration. All the buildings in the city are made of pink sandstone therefore it is called as pink city. There are a number of lavish and luxurious forts and palaces in Jaipur which bathe in light of the festival to present a breathtaking sight. One of the best places to admire the city is from Hawa Mahal. Back in 1876 when Queen Victoria planned a visit to the city, the then King of Jaipur got the whole city painted in pink which is the color of hospitality. It was a gesture of welcoming the queen. To celebrate this bright festival in the vibrant Jaipur city was the most memorable experience that we had in India. The spectacular city just makes the celebration even more special. There is a happy and friendly atmosphere in every corner of the city. All the people come out in streets or on roofs to light crackers and fireworks. Amber fort is a great blend of ancient architecture and charm which attracts tourists till date. The fort was built by Rajah Man Singh I in the year 1592. The fort is surrounded by lush gardens and a small lake which add to the beauty of its surroundings. Since the fort is located at a hill top, visitors prefer to take a jeep or elephant ride to reach the top. While the exteriors of the fort sing of its old age and glories, the interiors are charming and elaborately decorated. Hawa Mahal also known as the Wind Palace is another breathtaking palace in the city of Jaipur. Built in the year 1799, Hawa Mahal allows the passing of winds as there are numerous windows in the palace. The windows were originally constructed to allow the women of the palace to have a glimpse of the outside world. The top of this palace offers a captivating view of the city. Our Indian tour during this time was full of thrill, glamour, colors and excitement and why not? We were in the most vibrant city attending the brightest festival and an invitation to a Muslim Indian wedding was like cream on the cake. Indian weddings are an elaborate affair as they go on for weeks. In small villages like the one where we were invited, almost entire village becomes a part of the wedding and celebrations. The final wedding day brings along a lot of excitement, decorations, delicacies and extravaganza. The groom comes to the bride’s home on an embellished horse along with all his family and acquaintances. The procession looks like a happy get together with music and dances. While the groom and guests are dressed up in shimmery, elaborate outfits and bride is all dolled up in traditional Indian outfit. At the wedding venue the hosts i.e. the bride’s family welcomes the guests and offers them food, sweets and greeting are exchanged. The couple gets married by traditional rituals and they both have food. The bride is sent off to groom’s family once all the rituals are over. It was the most memorable experience for us to be in Jaipur during Diwali when we also got to attend this wedding. We had toured and travelled so much that we eventually exhausted ourselves. Fortunately we reached this place which had a relaxing atmosphere with a nice pool. We spend a good time here, lazing around and relishing delicious North Indian food. This is a highly recommended restaurant as everything is pocket-friendly and the quality of food is good too.